Robert the Doll is over 100 years old. Robert the Doll receives handfuls of letters daily. Most of them apologies. He even received a birthday commendation letter from former US president George W. Bush. 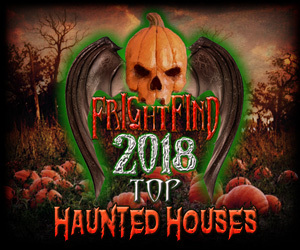 Robert also has thousands of visitors each year and is featured in videos on YouTube with over a million views. Why? Because Robert the Doll is haunted. 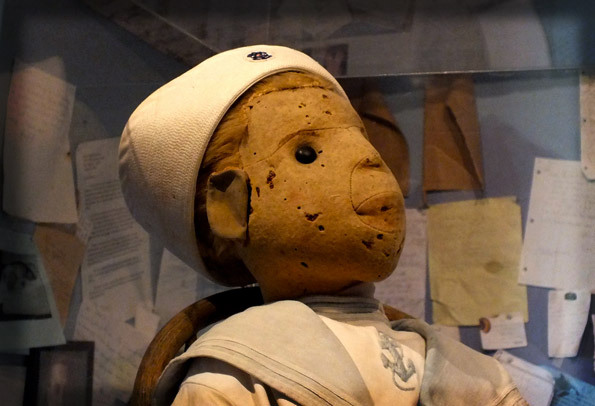 But before we dive any further into Robert, let’s take a quick look at the history of dolls in general. Dolls are kind of creepy. 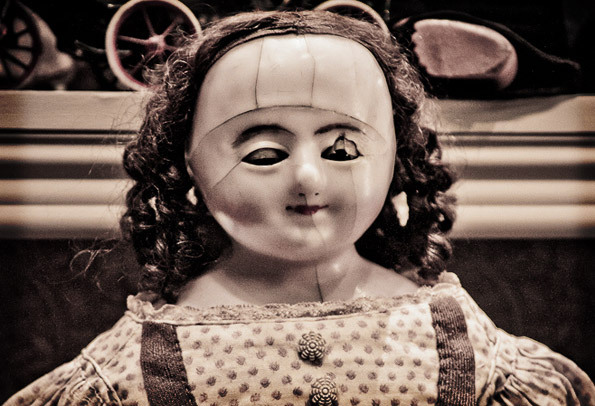 Okay, dolls are really creepy. And even well-intentioned dolls can still be a bit off putting. This is a Mourning Doll. 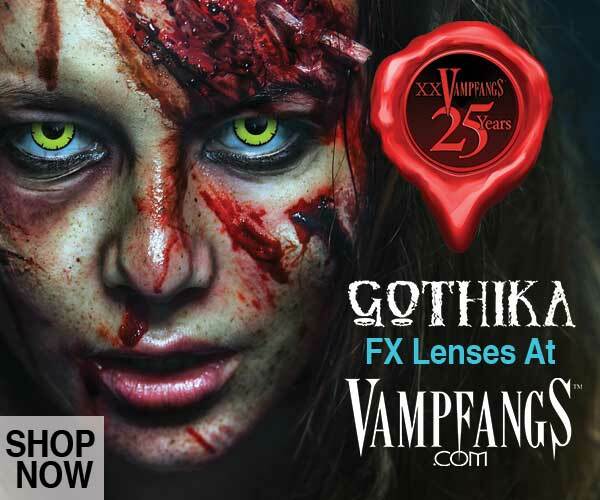 Those dead eyes just stare right into your soul. Egyptian Paddle Doll circa 1750-2040 BC. It’s been suggested that dolls were possibly the first toy ever created. With the discovery of wooden paddle dolls in Egyptian tombs dating back to the 21st century BC, it appears humans have always had a desire to create lifeless, miniature versions of ourselves for some godly, or ungodly, reason. 2017 is shaping up to prove no different. Movies like Jigsaw and Cult of Chucky are slated for release later this year, and with the recent release of Annabelle: Creation, which already holds a 7.3/10 IMDB rating, it’s apparent that our fascination with dolls is growing, albeit with a twist. 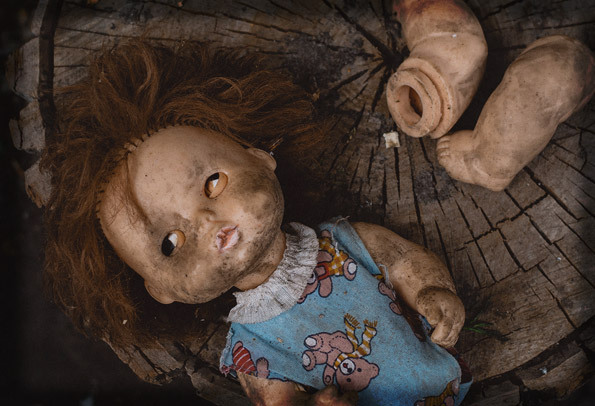 Pediophobia is the fear of dolls and it’s a pretty common thing and growing thanks to some of the recent hype and films. Most researchers have chalked it up to the “Uncanny Valley” effect. The “Uncanny Valley” is a psychological phenomenon in which something resembles a human almost perfectly. But just almost. Our brains detect that something is off while trying to reconcile that we’re looking at a human-like figure, so the observer gets an eerie or uncanny feeling that something’s not right. Making them even creepier, albeit useful, dolls were also often used during times of grieving, such as the case with Victorian Mourning Dolls. Mourning dolls were wax effigies formed in the image of a deceased child or infant, often dressed up in the child’s clothing and created with the child’s actual hair. The dolls were frequently left on gravestones or kept by the family as a physical reminder of the deceased. So dolls have definitely served some useful purposes and there is a seemingly logical reason behind why so many are terrified of them. But then a doll like Robert comes along and you realize these plastic lifeless hell spawns deserve all the pediophobia they get. As mentioned before, Robert is a fairly well-known doll in the creepy doll world. Robert was the inspiration for possessed dolls like Chucky of the Child’s Play series and is often compared to the Annabelle doll of The Conjuring films. 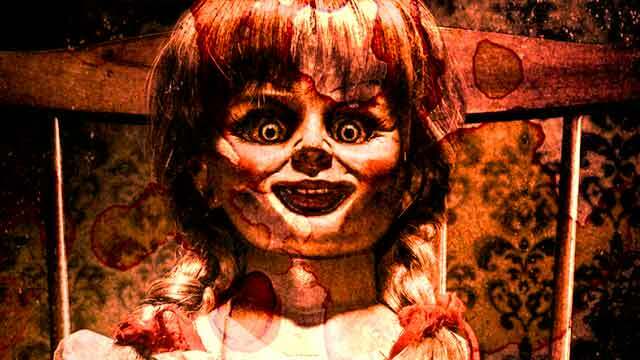 How did Robert the Doll come to be haunted? Robert “Gene” Otto received Robert the Doll when he was only six years old. The doll was handmade and is reported to have been created by the family’s Bahamian servant who practiced voodoo and black magic. She gave Gene the doll during a period of her own grieving over the loss of her child. Robert the Doll was made with a wire frame, hay, old clothing and some of Gene’s own hair. 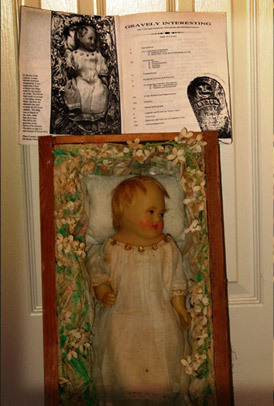 The doll was given the name “Robert” and was gifted to a young Gene Otto. Robert the Doll and Gene became inseparable. Gene Otto as a child, playing in what is likely the same sailor outfit that Robert the Doll now wears. Gene would take Robert on trips, dress him in his own clothes and talk to him as if he were another child. Gene supposedly named Robert after a particularly rough scolding from his mother, telling her he would prefer to go by his middle name Gene because Robert was the name of his doll. Shortly after that exchange, Gene began blaming accidents around the property on Robert and talking to him regularly. 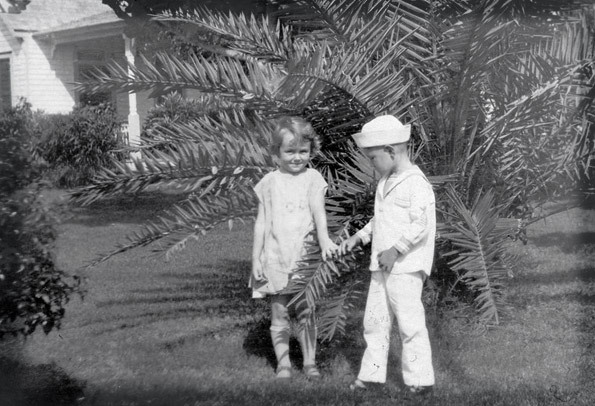 Children have always been known for their large imaginations, but servants and family members began noticing oddities surrounding Robert and Gene’s relationship. Soon it wasn’t just Gene talking to Robert, rather – according to the family – Robert would actually talk back. At first, it was assumed that Gene was simply responding to himself, but after witnessing the two conversing, some relatives were convinced that the doll was able to produce sounds and giggles on its own. Visitors to the home would swear that Robert the Doll moved about the house unaided and neighbors insisted that Robert would watch them from windows when the family was out. Gene’s Death. Robert the Doll Moves On. Apparently, none of this bothered Gene in the slightest. Gene Otto went on to become a rather famous artist in Florida, with plans to make his own house an art museum. Gene kept Robert his entire life, up until his death in 1974. 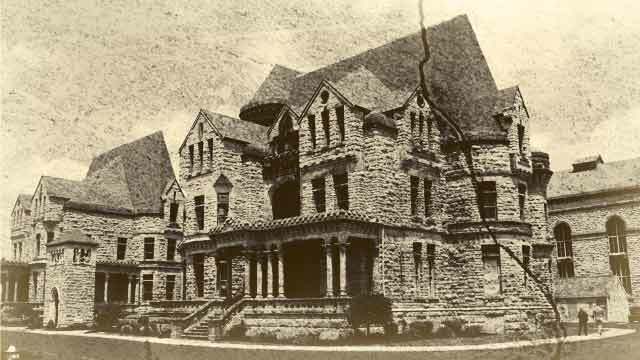 Gene’s home was sold to a woman named Myrtle Reuter the same year, who found Robert in the attic and fell in love with him. Myrtle kept Robert for years and supposedly witnessed his miraculous ability to move around the house untouched multiple times. In 1994, Myrtle donated Robert to the very museum that Gene had contributed works to during his lifetime – The Fort East Martello Museum in Key West, Florida. Shortly after receiving the donation, the museum began reporting various anomalies seemingly tied to Robert. Visitors to the museum even today report electronic equipment failures and camera malfunctions when trying to video the doll. Others, including a reporter named Malcolm Ross, claimed to witness the doll’s expression change. Ross recalls his experience viewing the doll with a friend as the friend recounted the tale of Gene and Robert. When one of the people present made a comment about Gene being a fool, Ross reported that Robert’s expression changed to one of disapproval. Today Robert receives thousands of visitors every year, many who make international trips just to view him. Many of the visitors are fans of Robert and come to pay their respects to the 3-foot long doll and his owner, Gene. 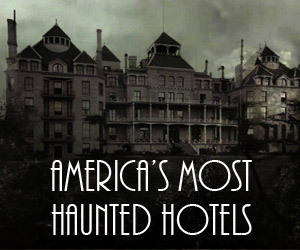 A handful of regretful others, however, claim that there’s something more sinister to be found. I didn’t ask for your permission to take your picture, and I openly mocked you. Like I said, I was just trying to be funny and impress the people I was visiting with. I in no way actually meant what I said, and I realize now I made a big mistake. The letter goes on to describe a series of events that shortly followed a visit with Robert, including multiple health issues, family members and pets that passed away, financial difficulties and bankruptcy. Another letter begs for forgiveness after similarly snapping pictures without Robert’s permission which the writer felt contributed to a kitchen fire, a near car accident, and a childlike “giggling” sound coming from the family’s basement. Whether it be a case of mass hysteria, odd coincidences, or simply intrigued fans who want to prolong Robert’s legacy, each new day brings with it letters from around the world for Robert, who still resides prominently on display in his glass case. 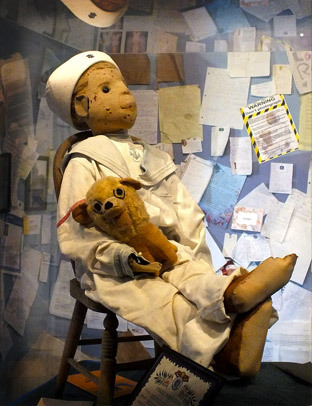 Should you wish to visit Robert the Haunted Doll at the Fort East Martello Museum in Key West, FL is open daily from 9:30 AM to 4:30 PM. And our advice should you visit? Maybe ask Robert’s permission before you snap any pictures.